I added a wide range of 'variations' to the game, with a school friend, years ago - Just recently started to re-play it, with another friend - Beyond the basic principles, its a different animal altogether, really ~ Thought it would be an interesting exercise to 'codify' it. 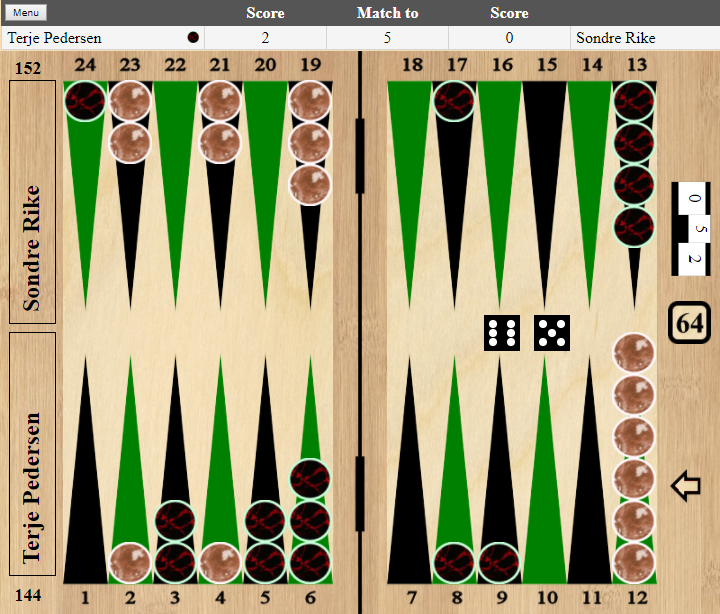 I have dubbed this game 'Welsh Backgammon' (purely because that's where we played it). Some of the changes are borrowed from other variations, some we made up ourselves. I make no claim to it being better or more skillful than the real thing - pip-counts go out of the window, for example -- But it is simply my preference, for providing more thrills-and-spills, along the way ... Take it or leave it, as you wish. Thanks ..
1. (Welsh) Backgammon is a two player game where each player has fifteen pieces (men) which move between twenty-four pointed-triangles (spikes), notionally divided into four 'quarter-boards' of six spikes each, according to the roll of two dice. The objective of the game is to be first to check out, i.e. move all fifteen men off the table. It is a matter of mutual agreement how many games will make a match. (Recommended: First to 20 games). 2. Starting positions: Same as standard game. 3. The 'doubling die' is not a rolled-die, but a marker with the numbers 2, 4, 8, 16, 32, and 64 inscribed on its sides. Either player about to roll may decide that the game be played for twice the current value (ie, it immediately becomes worth two games). Initially, he indicates this by showing the die with the '2' showing. The right to re-double (showing '4') then belongs exclusively to the other player. This right 'passes over' again each time a player elects to use it. If one player has not checked-out any men by the time the opponent has checked-out all fifteen, then the player has lost a gammon, which counts for treble (three times) what the loss would have been, otherwise. If the losing player has not checked out any men and still has any men 'on the roof' and/or outside his final quarter-board (see later), then the player has lost a backgammon, which counts for sextuple (six times) what the loss would have been, otherwise. (Note: 'Gammons' and 'Backgammons' do not apply to 'Three On The Roof' game-wins ~ see later). The maximum the doubling-die can go up to ('per game') is times-64 games. In theory, therefore, the maximum score from 'one' game is 384 (64, multiplied by 6 for a backgammon). The spikes form a track in the shape of a horseshoe, travelling through all four 'quarter-boards', and the two players move their men in opposing directions, such that their two 'back men' end up in the quarter-board where the opposing back-men started. These start/finish boards are called 'inner' or 'home' boards. To start the game, one player rolls his two dice, but concealed (on this occasion only) under his cup. The other player guesses 'odds' or 'evens' (for the combined value of the dice). If the other player is correct, he gets the choice of whether to go first or not (and otherwise, the shaking-player has the choice). When a new game (within the same match) commences, it is 'mugs away' (the right to go first) to whoever lost the previous game. The players take alternate turns, rolling two dice out for each turn. When play gets underway, both dice must land completely flat on the game-table (or else they are 'cocked', and both re-thrown). After rolling the dice, players must, as far as is possible, move their men according to those numbers. The numbers may be such that a player 'can't go' on a turn (or for a 'half' of that turn). But a forward move cannot be voluntarily 'forfeited'. Where, for example, there is only one way of moving the 5 of a 5-2, then that 5 move (the greater of the two) must be made if possible (even if the 2 move is then impossible). Similarly, at the end of the game, one of the men who cannot check-out (see later) may have to just move by that number instead. Otherwise, there is no general requirement to move one die-value before the other. If a player rolls two of the same number, called doubles, that player uses those numbers twice-over (eg, 6-6 is deemed to be a 'four-die-value' of '6-6-6-6', and so can be used by one/ two/ three/ four men, moving in multiples-of-6 : with 24 moves made in total). Whichever spike a man has legitimately ended up on is where he has 'settled', for the time being. There can never be any 'mixed spikes' - ie, opposing men cannot settle on and occupy the same spike, at the same time. As a general rule, as a result of a move, a man may settle on any spike that is unoccupied or is occupied by one or more of the player's own men. It may also land on a spike occupied by exactly one opposing man, or"blot". In this case, the blot has been "hit", and is knocked-back to the side of the table in a 'zero' starting position ("on the roof"). A man may never settle on a spike occupied by two or more opposing men ("covered"). The dice numbers can be combined into a single, larger move. For example, 5-4 can be a one-man move of 9, and, if played, that is where the man has 'settled'. This means one 'man' can run past a covered-spike either 5 or 4 points ahead; and, by the same token, cannot hit a blot 5 or 4 points ahead, and then keep moving on to 9 (it must be one or the other - and, again, it may have to go by the 'greatest' number - in this example, 9 - if no other man can make good those moves). There can be no more than six men settled on any one spike, at any one time. An exemption to the usual 'blot'/ hit rule. Where a player has a blot on every spike in any one quarter-board, he has created a 'full spread', and none of those blots can be hit, for as long as the full spread remains in place. This further limits the number of spikes the opponent can settle on. 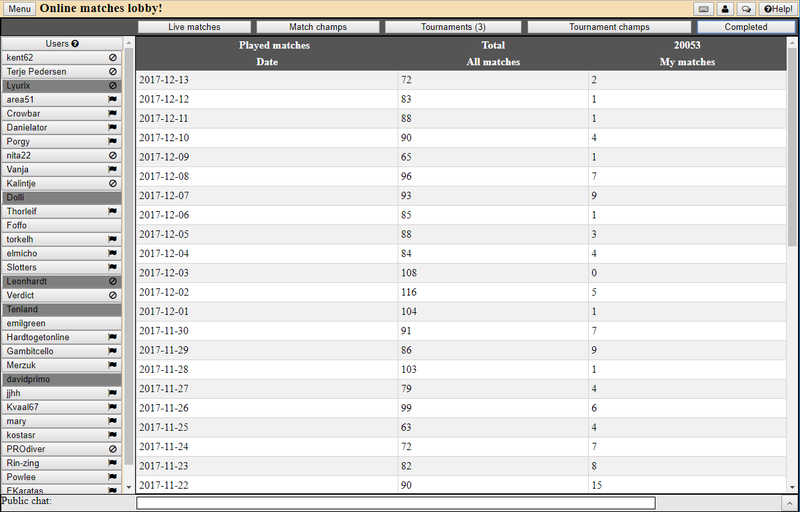 Where playing with an overall play-time limit (with stop-clocks) per player, then a player who runs out of time loses the whole match automatically, irrespective of what the games-score was up until that point. (Recommended: 75 play-time minutes each). A player has the option of throwing again, for some other number-move instead, whenever he throws a 1 on one die with a 2 on the other. Blots that have been hit and are sent to the 'zero' position are said to be 'on the roof'. If a player has three or more men on the roof at any one time, then he loses the whole game, automatically. If the value of that game has already been increased, then it stands at that value. Men continue to move in their 'usual' fashion (one spike as a one-value move), except when they are Crossing The Stream. In order to move away from an outer quarter-board, the spikes on that board are deemed numbered from 1 (by the central 'bar') to 6 (at the edge). The man has to move out with a die (or combination of the dice) equal to the spike-number it is sitting on - whereupon, it 'crosses the stream' in a straight-line movement to the same-numbered-spike opposite. (The 'normal' mode of moving within the quarter-board is unaffected). As examples, for an (opening) roll of 6-4, a man can be sent across-the-stream from the 6-spike, then move another 4 forward, so that he joins the spike with the three men on it ... A roll of '1-1' (1-1-1-1) may get a man across from a 1, 2, 3, or 4 spike. 16. Men on the roof must re-enter the game through the opponent's final 'home' board before any other man can be moved. With two blots to bring back in, this rule extends to both of them. (A 6-6 roll - known as 'boxes' - is the only roll in this context that gets a man from the roof 'straight' into his own final quarter-board = 6 spike to outer 6 spike to 6 across the stream to 6 spike ready for checking out). Where a ​man needs to come back on the board from the roof but cannot find any spike to settle on (for example, on a 3-2 throw, the 3, 2 and 5 spikes are all unavailable), then that player is 'dancing' (often 'missing a turn', in effect); and the doubling-die is automatically moved up to the next higher value (going to '2' if previously un-used); no matter who is holding the right to use it next, at that moment in time. Note: Any 'ended-turn' resulting in one or more of that player's own men still being on the roof is a 'dance'(including 'one-in', but with no opportunity to get a second blot in). However, there is deemed only one 'dance' for one throw; and the rule cannot apply where the doubling-die had already reached 64. Only when all of a player's (remaining) men are in that player's final 'home' quarter-board, may that player start (or re-start) removing them ("checking out"). In this inner board, the spike on the edge is deemed '1', through to the '6' spike, up against the central bar. A die or combined-dice value of 6 may be used to check-out a man from the 6-spike, 5 from the 5-spike, and so on. A player who rolls too big a number for these purposes 'busts'. It also remains an option for men in this end-zone to simply keep moving within it. During each game, the player who is the first to start checking-out is awarded with a 'one-off' additional bonus-throw immediately afterwards (ie, before his opponent plays again). During each game, on the first occasion at which one player (but not the other) is left with a potential 'one-throw win' on his next turn (eg, 2-3, to take off two remaining men on the 2 and 3 spikes), then the other player can offer to concede the game (at some smaller 'loss' to himself than would otherwise be the case). This offer is then either accepted or rejected - and it can only be proposed on that first occasion. Note: because of the 'twice-over' effect of doubles-throws, then, if there were four men ready to be checked-out on, say, the 3-spike; then a roll of 3-3 could remove all four of them. (where it does not have the 'company' of any team-mate or opposing man); then this man becomes a 'rover', and it is entitled to move backwards as well as forwards. This is not a 'permanent' entitlement. A rover may already be in existence at the start of a turn (and there may be another one 'activated', from another quarter-board). It can also be created (or re-created) after 'half' of a throw used (ie, where a decision to move has been taken on one die, with use of the other die-value pending). Each 'one-die' (or combined-dice) value, in itself, is used to go either forward or back. Apart from that, any 'variety' of forward or back is legitimate. It can also cross-over into another quarter-board (including goingback across the stream), and still retain its entitlement in so doing (at least for the duration of that move). A backward move uses-up that move (or 'half-move'), even if it could have been done forward. However, all backwards moves are optional, and can be waived (including the use of one die-value, and the waiving of another). Note: If a chosen backward move then results in a situation where only the rover is able to move forwards (for the other die-value), then that move must be made (and where the man ends up is where he settles). At the end of the game, where there is only one man sitting in the home board, waiting to check-out for a win, then this man is also a rover - Thus, if sitting on, say, the 2-spike; then in addition to '2' or 'Double 1' rolls, he can also check-out with a 1-3 (ie, 1 back then 3 forward), a 3-5 or a 4-6. ​​Throughout the course of the whole match, each player has the right to "nominate" the throw - on one occasion, each. The player indicates this by placing an agreed object (such as a 'joker' playing card) on the table and deciding & announcing the value of the next throw (whether that upcoming throw be by him or his opponent). He may say, for example, 'Nominate - for myself - 5-4'. The dice are then 'set' to these values (ie, no 'shake'), and the available moves made, accordingly. I'm not sure what I must do to continue a game saved. If I invite to the player to play usually it starts a new game and delete the old game. Depends also on which interface you are using. 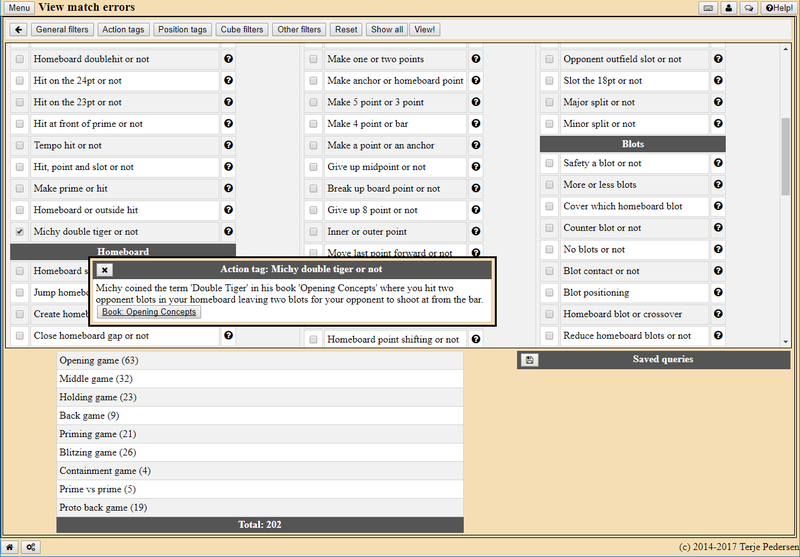 With FIBzilla, highlight their name and instead of choosing a match length, at the very top of the numbers in the drop down menu is the letter "S" for saved. be sure you have Java installed in your system or the program won't work and you'll receive an error message. the installed version should appear. If it shows anything other than "version (number, blablabla)", you don't have java installed. then repeat check version step. after that, everything should run just fine. He bears 2 checkers off.... WHY? 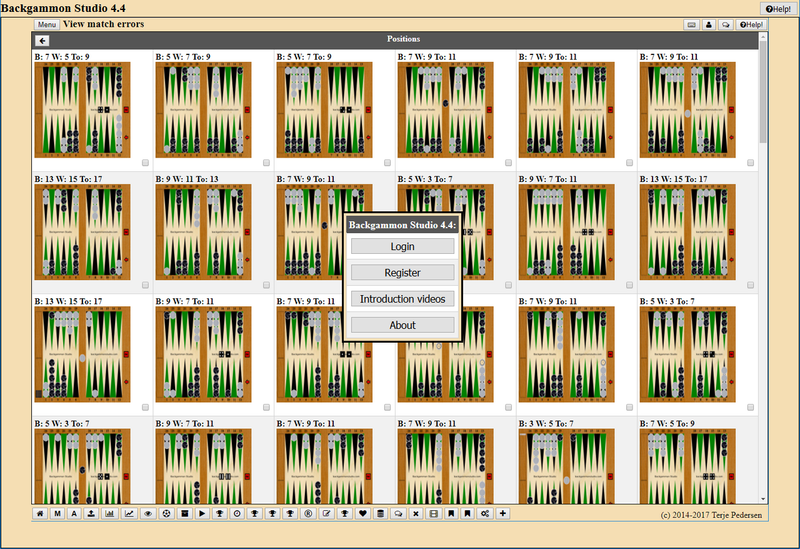 A great site for learning the game is Backgammon Galore. The attached screenshot will show what they have for the rules of bearing off. I'm not sure why you are confused? He rolled a 4 - 2, he can only remove 2 checkers. If he had rolled doubles, he could remove all 4. From time to time there is a request to recover a forgotten FIBS password from a JavaFIBS 2001 preferences file. Due to some obfuscation (not really encryption) you can not easily recover it. So I decided to document the algorithm in the form of a small Python code snippet. In the hope that this is useful - no warranty, no copyright. Written 2017 by Ingo Macherius and hereby released to the public domain. You find the preferences file needed in the JavaFibs2001 installation directory subfolder "user/yourfibsnick/preferences". Double Tiger! Michy's Double Tiger! Hit two blots in your homeboard leaving two blots or is that too wild? Lucky! You have no anchor and more than 1 man back. Opponent has a 3 point board against your 1 point board. Are you feeling lucky? European splits! Should you move your last blot forward possibly making it easier for it to escape? Danger doubles! You're on the bar with a directshot but behind in the race. Can you scare your opponent into dropping? Login screen has gotten a facelift with a fading slideshow. It is possible to specify that the cube should be centered when searching for positions. Suggested by negheonegu. The online match lobby has been cleaned up. 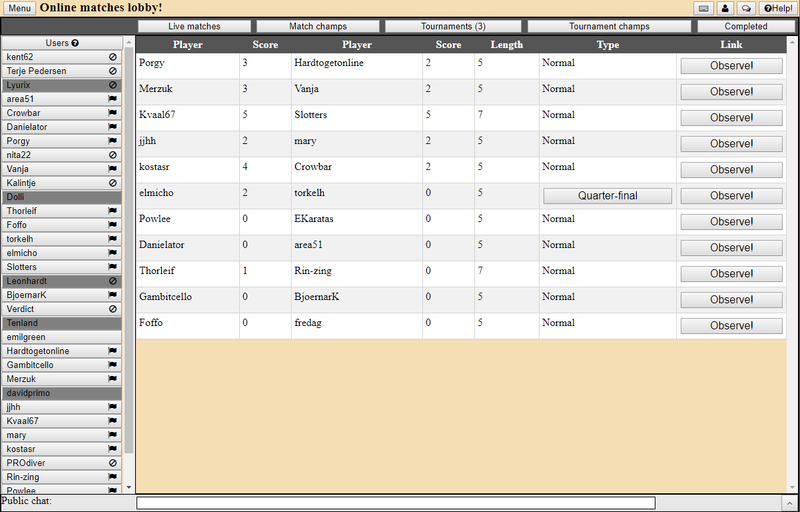 Chat in online matches has been cleaned up (when you don't see it below the board). In the incomplete match list you can now see flag of opponent and last login to help you find a good time to poke your oponent next. Play through a match as both players. Suggested by Thomas Kristensen. Support for longer matches. Up to 25. Suggested by BoardLord. Challenge dialog now has additional help info. Static board numbers. Suggested by EKaratas. Non responding opponent to a resume request is set busy after 1 minute. Allows you to challenge other players. Country requirement for tournaments uses connection country as fallback if no profile has been created. 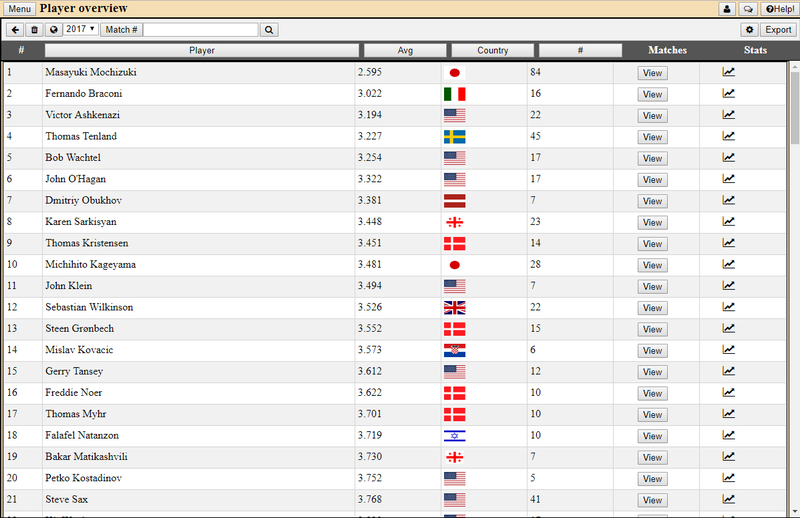 Observers list is now dynamically updated. It is now possible to set a custom clock setting (nice for double consultation matches). Suggested by Anita. It is now possible to enter an event override when importing matches. First move hint if you don't do anything when playing online match. Problem with chat on android tablet. Reported by Leeuk66s. Problem with chat button overlapping clock. Reported by Gambitcello, area51 and possibly others. Problem with timed training tracks and selecting random track. Reported by tnt-foxtrot. Go for the kill putting two checkers on the bar or just play it quiet? Search for Michy's Double Tiger positions in the search section. New login page now with no ads! A fading slideshow of interesting sections found inside is shown. The match lobby has been cleaned up with a row of buttons to display different subsections and the chat can be raised/lowered with the small arrow key at the bottom right hand side. On mobile you can swipe left/right between sections. Nice turnout in the evenings european time! 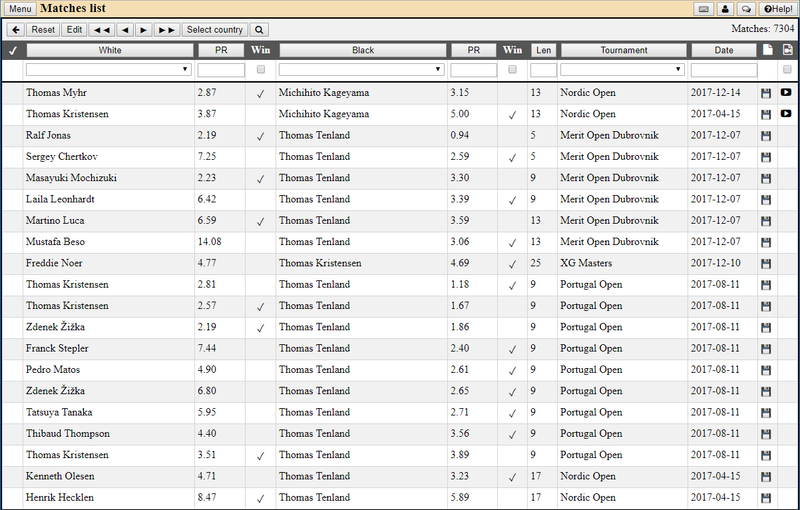 Also an incredibly strong performance by Thomas Tenland! He was in the top 10 last year too! Two other players who weren't in the top of the 2016 list: Karen Sarkisyan and Sebastian Wilkinson! Amazing! Congratulations! Should you share your tournament matches with Backgammon Studio? Don't take my word for it! Florin Popa: "My hard disk got broken so I lost many of my live matches but because I sent them to you I can find them again".